One of the most popular New Year’s Resolutions is to “spend more time with my family.” National Wildlife Federation says one of the best ways to keep that resolution all year long is to head outdoors where families can enjoy time together while improving the physical and mental health of their children. In 2013 resolve to "Be Out There" and spend more time in the company of Mother Nature. By doing this, families can recapture an essential part of childhood that is being lost; the part that makes outdoors the favorite play space. It’s easier than you think to work into a family routine and National Wildlife Federation’s "Be Out There" program will be there throughout the year with activities, ideas and inspirations to get more green time into kid’s lives. While acknowledging its importance, parents also shared the biggest road blocks for making outdoor time happen: weather (61 percent), safety concerns (38 percent), lure of technology (36 percent), homework (31 percent). Add to that all the extra-curricular activities that kids today are involved in and it’s not hard to understand why outdoor play time is losing ground. Smarter – Kids who spend time playing and exploring outdoors learn teamwork and problem-solving skills. They also score higher on cognitive and standardized tests. Caring – Playing outside is life insurance for the planet: children who spend time outdoors as kids are more likely to care about wild things and wild places when they become adults. 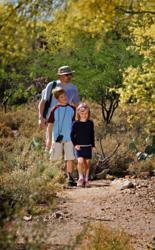 Take the pledge to "Be Out There" and pick up ideas on how to enhance your family’s outdoor time. Learn about simple and fun activities that can incorporate nature into your child’s life. There’s a reason they call it the great outdoors and a New Year’s Resolution to "Be Out There" will help your children understand why. This is one time out the whole family will enjoy. National Wildlife Federation is America’s conservation organization protecting wildlife for our children’s future.